Does silence in strategic alliance work? Last week I wrote about our encounter with Royal Mail on Direct Mail options which ended in having to go back to the drawing board. As Ed Rivis rightly remarked in his comment on my post: Direct Response Advertising is what it's all about when targeting specific not yet known prospects. Because we don't know what type of floor covering and in what kind of state the new home owners will find once the Big Day has arrived our aim is to offer handy "first-aid" tips for stain removal and simple maintenance on both wood flooring - our own expertise - and carpets - of which we do not have "inside" knowledge. Fortunately, we have been in contact with a carpet cleaning company who indicated over a month ago they were in for strategic alliance. On their request earlier I was following a sequence of email messages about how to find a decent carpet cleaner and how to spot the "tricks of the trade". I also submitted some IMHO constructive comments on the messages, the layout and the style used; sharing our own experience with email marketing and the results we have. Their sequenced emails keep coming, but no reply to my comments. So, in regards of our new project, we gave them a call and left a message on the answering machine over a week ago. Which is a pity, because if we work together on this project, they could do the same for new home-movers in their area and use our tips on stain removing and maintaining wooden floors while promoting their own services to those with carpets. Fortunately we always have Google to search and find the information about stain removing etc ourselves to compile the report we have in mind on our own. One site I discovered truly is a gold mine on giving information, tips and advice on all kinds of stains and how to prevent/remove them. Great, problem solved I thought. All I have to do now is contact them and request permission to use their info - with naming the source and linking to their site - for our reports. Their contact page invites feedback, by subscribing to their newsletter and entering a comment in the text box. Which of course I promptly did. A kind request to share and promote their expertise on stains. Great, another chance to explain to the person in charge our idea. So I replied to the email with an offer to do even more than the above, we would be more than happy to inform all of our contacts of their site. A new (auto?) email which arrived in my inbox yesterday. Oh yes, I'm interested in interesting information but was actually hoping they would be interested in our proposal. Or at least acknowledge our request. It seems they are more interested in the number of Like's on Facebook. Pity, we could have added so much extra free information to their site in regards of stain removal and maintaining wooden floors to the benefit of their readers and "fans". what's with businesses that seem to step on the Social Media and webmarketing ladder only to turn it into a one-way traffic: from them to us. To them I can highly recommend the "Age of Conversation 3 - It is time to get busy"
There was a ps in the last email: "If you would like us to stop contacting you please reply to this email with 'REMOVE ME' as the subject." What I'm wondering/even begging is: how can I make you contact me in earnest?? So, stuck again? Back to the drawing board again? No, I've decided to do exactly what they are asking: use their tips and link to their site and Facebook page because all in all the information that can be found there is a gold-mine and would absolutely benefit our yet unknown prospects who just moved home and might be facing stains on (inherited) carpets. We like to help out - that's how we grow our business. And if need be, as it seems now, we go-it-alone! Last week I had a visit from one of Royal Mail's New Business Managers to discuss Direct Mailing options Royal Mail has to offer small businesses. We are always interested in trying out different marketing methods and this meeting would go deeper into the option "home-movers". The Royal Mail person had experience in helping to organise a marketing campaign for small to medium businesses targeting those who are about to move home or had just moved. Since Ashford Borough with its new excellent High Speed Link to London (and the Eurostar to mainland Europe) it is getting more and more attractive for commuters looking for a more rural (and cheaper than London) life. A great source of new prospects for us, but how to find them in time? Moving home is rather stressful, specially the way here in England you seem to buy a house - for us Dutch people still a very strange and unbelievable illogical and even weird way: until the actual exchange date the deal could go pear-shaped and accepted offers don't seem to mean anything at all. And everyone is in a chain of selling/buying homes where if only one shackle breaks all the other deals are off too - with no compensation for the "innocent". Until the actual exchange no-one is even certain the home of their dream will be theirs and therefore no one ever plans many new items for the new home in advance. Which means we - as retailer in wooden floors - should not contact possible new prospects in the area until after they truly moved in (in a chain everyone seems to move on the same day or weekend because the next new owner is queuing up) and the dust of the stressful move has settled. For us from a different country where you would have at least one week to prepare your new home (including new floor covering) for the arrival of the contents of your old home a strange concept to get used to. The direct mail marketing campaign we wanted to discuss would therefore focus on an informative way to new arrivals in the area about their existing floor covering, very often "inherited" from the previous owner. Being informative has always been and always will be a large part of our marketing strategy, direct mail marketing using home-movers data from the Royal Mail would be a new tactic for us. During the conversation with the New Business Manager we discussed how we market our business normally, the internet and email marketing are still the main tactics. We do have one "paper" ad in a local "Village Directory" that is publish monthly, contains ads from local businesses and local news. It's distributed in many villages around Ashford town, and in our experience is the only paper ad that works for us. "Well, your branding is missing." He completely missed the message in the article, the offer to help solve a problem. Fortunately the readers of the Village Directory care more about the message than about the missing banding "headstone". This morning, enjoying my first cup of coffee of the day, I continued reading my copy of the Age of Conversation 3 - It's time to get busy - and was reminded of the above misguided remark when I came to the excellent contribution of Efrain Mendicuti (page 59) "Branding is not about your ad campaign". Mr Royal Mail New Business Manager seems to think it is, headstone included. Pity. Talking about branding and "headstones" - how about Google's latest "logo" display! The text in the extra button below the "logo" is IMHO absolutely priceless! They are welcome to it, and well done to put a smile on many faces. I lost count of all the tweets yesterday and today pointing me towards this remarkable piece of creativity. For our business I'm more than happy our brand gets across as being the most informative business, helping to solve problems in regards of wooden floors - before, during and after the installation of it. Honestly think this does not need a headstone or logo. Just the right message. How do you tackle FAQ? Could this be for you too? In my contribution to the "Age of Conversation 3 - It is Time to get Busy" (page 11, in the At The Coalface section) I try to explain in just 400 words how we use Q and A's to grow our business, one question at the time. Enabling a visitor to your website to submit a question is a great way to start a conversation. We first started to use this principle when we launched our blog-site: FAQ & News site where we turned the comment box into a "ask your question" box. Now, not everyone is happy, willing or sometimes even internet-savy enough to have their questions/problems made public, no matter if the subject is only "wooden floor" related. Plus, although we both publish our answer online in the comment box and email the person who asked the question, we're not always able to follow-up on this Q&A to find out if our answer solved the problem. One way to tackle both issues in one go is to create a so-called "extended" webform in AWeber or any other autorespond software program. The "text-box" in the webform is large enough to contain a very long question, allowing your visitor to describe the situation and problem in detail. On the page of the form you explain that the question will be answered personally and in private - so quite different than using the comment box of a blog. And on the thank you page, when using a autoresponder program that uses double opt-in, like AWeber, you must explain thoroughly that the question will only land in our inbox when the "subscription" is confirmed. This means some questions never land in our inbox and a problem is not solved. I'm in favour of double opt-in, to prevent spamming, but in these cases where you offer to answer questions and the webform is not intended to send a marketing/sales message it works as a break on the conversation. Since end 2009 we use Octane HQ for our autoresponder (and for much more) which uses only a single opt-in (and where we are blocked to email the subscriber again through the system, once he/she unsubscribes using the "from all lists" option - a very strict "opted out" rule in Octane HQ). With this method, every question lands in our inbox and is followed up personally. How does answering questions for free helps us grow our business? Our answer is first and foremost to help solve a problem, not selling a product. But it happens quite often we do receive an order - small or large - from the person asking for help. Based on trust established through the conversation (and because - no bragging intended - our products are of high quality). The second reason is it grows our database of FAQ's based articles in the most simple way possible. Every house, every situation and even every design style wish is different, so variations on a theme a plenty. And as every business adviser (every proper one that is) will tell you: the more you tell, the more you sell - again, see above the conversions from prospects to clients with free but valuable and relevant reports. We only need to "write" an article once, and re-use it whenever the needs occur in any combination or form we like. Plus the program contains a very versatile Image Capture Tool that places images into the article and when exported in any of the available forms are uploaded, printed etc instantly in the position we placed them in. I've written about it before, we used this program to write our "Wooden Floor Installation Manual", which exported as Word-document could be digitised as required by the "printer" very quickly, plus the same manual was instantly available as an online version for clients. Write once, use and re-use for ever. The last few months our FAQ & News site has "case-studies" posts, where the email conversation between prospect and us can be read and used by those who are in a sort-like situation or are looking for the same sort of advice/tips/tricks of the trade. And all these new Q & A's will eventually end up in new "how to..." books or short guides. One other benefit of generating new articles in ScreenSteps Desktop and publishing them on our blog is that when we receive a question already answered we simply direct to this published article - instant but still relevant answer. We are a specialised retailer, utilising FAQ's to assist/help/guide prospects/clients using our products and methods. How many other businesses, be it retail or service orientated, would benefit from using this "write once - (re) use for ever"? Your own business perhaps? New York, NY (May 07, 2010)—Almost three years ago, an online conversation between two marketing pros—an American and an Australian—evolved into a collaborative writing effort by more than 100 bloggers from nine countries, and was aptly titled The Age of Conversation. Fast forward to today and the abstract experiment is now a concrete treatise on the state of social media and marketing best practices as a whole. With Drew McLellan and Gavin Heaton still firmly at the helm, the third book in the Age of Conversation series has become a veritable “who’s who” of the world’s leading marketing bloggers. Age of Conversation 3 (202 pages; hardcover; paperback; Kindle; ePub) was published by new digital publishing company Channel V Books (www.ChannelVBooks.com), and is now available through all major online retailers, as a Kindle e-book, and will soon be available as an ePub for other digital readers. Age of Conversation 3 captures the distinct shift from social media as a hypothetical consumer loyalty tool, as it was considered only a little more than a year ago, to its current state as a staple in the modern marketing toolbox. Although the book covers more than just social media, the topic is ubiquitous among the book’s 10 sections: At the Coalface; Identities, Friends and Trusted Strangers; Conversational Branding; Measurement; Corporate Conversations; In the Boardroom; Innovation and Execution; Influence; Getting to Work; and Pitching Social Media. “We have seen an incredible shift in the role of social media over the past three years. It has moved from an outlier in the marketing mix to one of the strategic pillars of any corporate marketing or branding exercise,” said Drew McLellan. “And it doesn’t end there,” adds Gavin Heaton. “As the many authors of this new book explain, the focus may be on conversation, but you can’t participate in a conversation from the sidelines. It’s all about participation. And this book provides you with 171 lessons in this new art”. "Building your business one question at the time"
The book is also available on Amazon.co.uk and if you use the links below I will make sure the "rewards" I receive from Amazon's affiliate program will go towards the AoC3 charity of choice. USP or UCCP? What would your client hope for? My "personal librarian" Drew McMellan introduced me to a new book (new for me) last week in his regular "What I'm Reading" posts. 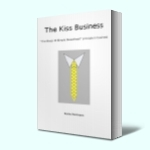 And although the title was a bit "trendy" to say the least: "The Recession-Proof Business" by Victor Cheng, I went to Victor's website and grabbed my free copy of the E-version. Do watch the video Victor made, understanding why he wrote this and why he's giving the E-version away for free will make you forgive his title pretty quickly. His book is not about this recession solely, it's about the principles applied by small/medium businesses in recession (deeper, longer recessions) over the last 136 years! One principle IMHO stood out, one I've wrote about earlier. Why, when we are so focused on telling prospects/clients what benefits they will have from our products/services do we keep talking about our business's USP - Unique Selling Point (or Proposition). Andy Bounds made it into a much better Proposition or Point: UBP, where the B stand for Buying. What would your prospect rather hear your business has? An Unique Selling Point or an Unique, Compelling and Credible Promise?